National Geographic releases iPad app for kids featuring dinosaurs—Rawr! 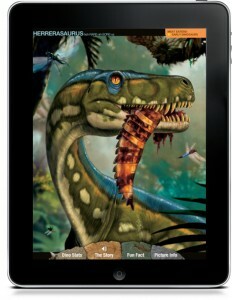 National Geographic has released the ultimate dinosaur reference guide for kids as an iPad application. The application, titled Ultimate Dinopedia: The Most Complete Dinosaur Reference Ever, is currently on the App Store for $5.99, but before you get all up in arms over the price, you should know that it’s worth every single penny. The Ultimate Dinopedia is full of amazing illustrations, and a boat load of video and interactive elements that effectively demonstrate how these giants from our past lived and interacted. This digital dinosaur encyclopedia has up to date information on over 700 of the dinos, and it’s been getting a lot of accolades from teachers and associations in the U.S. for its teaching qualities. Both the National Science Teachers Association and the Children’s Book Council have given their approval of the application as an “Outstanding Science Trade Book for Students K-12.” If your kid is into dinosaurs, you want this app. It’s phenomenal. National Geographic is playing up their Ultimate Dinopedia as an application for kids, but I have to wonder how many adults are returning to their childhood with the help of the application. I know I did. At least this time around I know how to say their names properly. Oh yeah, if your little one’s prone to nightmares, you might want to take the application for a spin first. As you can see from the image above, they don’t shy away from the dino-on-dino cannibalism. On that note, what do you think dinomeat tastes like? Steak or Chicken?